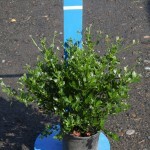 A dense shrub with leathery, glossy, small, dark green leaves. The late-spring blooms are dark blue. Well-drained soil is essential; it does well in dry conditions. It doesn't mind seaside conditions. Prune lightly in summer for form as needed. 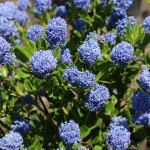 One of the hardiest selections of California Lilac.